Poached Turkey Breast with Easy Gravy is the perfect recipe for Christmas entertaining. Especially if you are short on time and oven space, the turkey will be on the table in 50 minutes. Poaching aids keeping the breast succulent and tender. 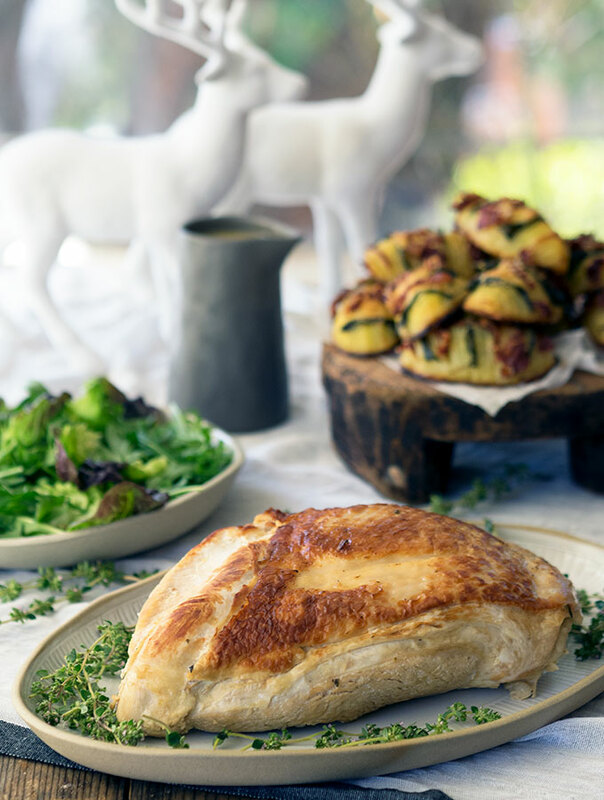 Even though Christmas day is filled with delicious morsels thrown on the “barbie” and seafood makes an appearance, there is still traditional fare that makes its way to my table. The Australian summer does not lend itself well to baked hams and turkeys accompanied with roast veggies. Funny enough a good portion of our population still loves having them on Christmas day. I’m one of those people. If you are planning on adding a more traditional dish to your Christmas Day lunch or dinner then poached turkey breast is brilliant! There are so many benefits to this recipe. 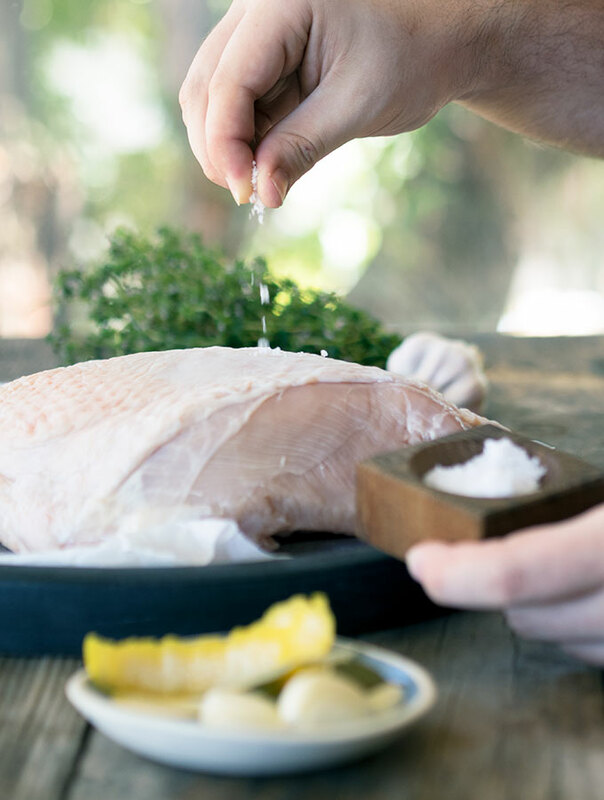 Poaching a turkey breast leaves you with a tender, succulent and juicy piece of turkey. Breast meat dries out so easily in the oven, this is one way to avoid moisture zapping mouthfuls. 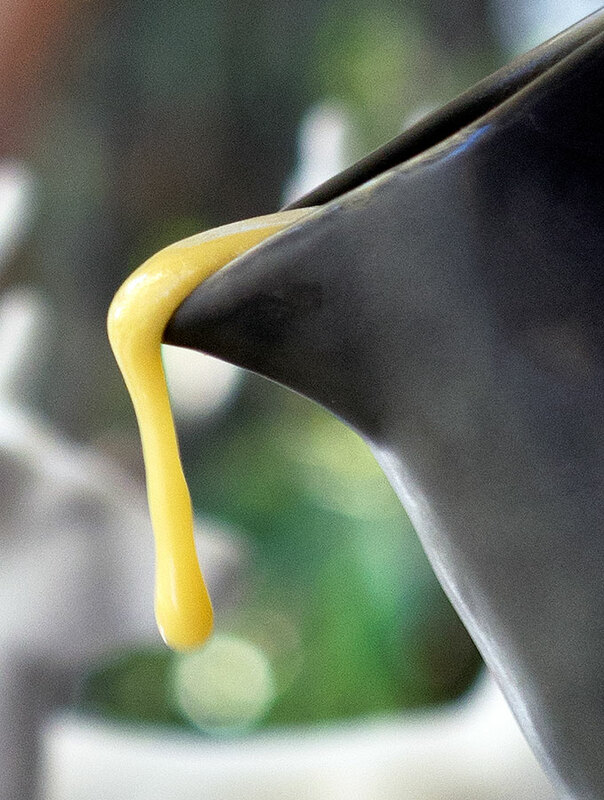 You are left with poaching liquid that transforms easily into an incredibly flavoursome gravy. 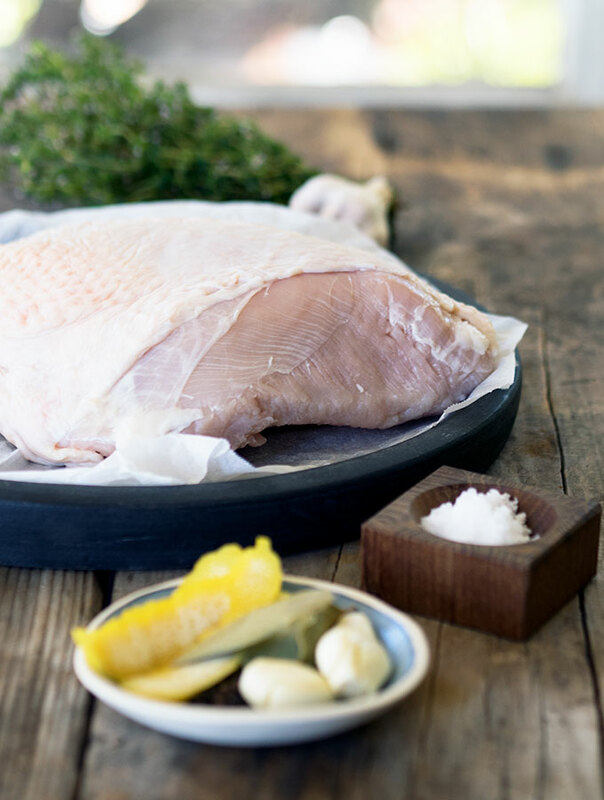 No stress and no fuss, the poached turkey breast does all the work for you. There is the extra space in your oven as you cook this dish on the stove, another bonus. Leaving you room to bake a ham, bake veggies or even heat up canapés. Or just leave the oven off and keep your kitchen cooler. To add to all the plusses, the poached turkey breast will be on your Christmas table in an hour (give or take a few minutes depending on the size of the breast). It’s a quick turkey dish to feed the possie without utilising the oven for hours. And let’s not forget that easy delicious gravy to serve up alongside. The one downside to poached turkey breast, you will need to order in a boneless turkey breast, skin on, from your butcher. It isn’t really a downside, you just need to plan ahead. Harley sticking her nose where it shouldn’t be…. again…. The poaching liquid infuses the breast with lovely flavour. Then those flavours are carried through to the gravy. 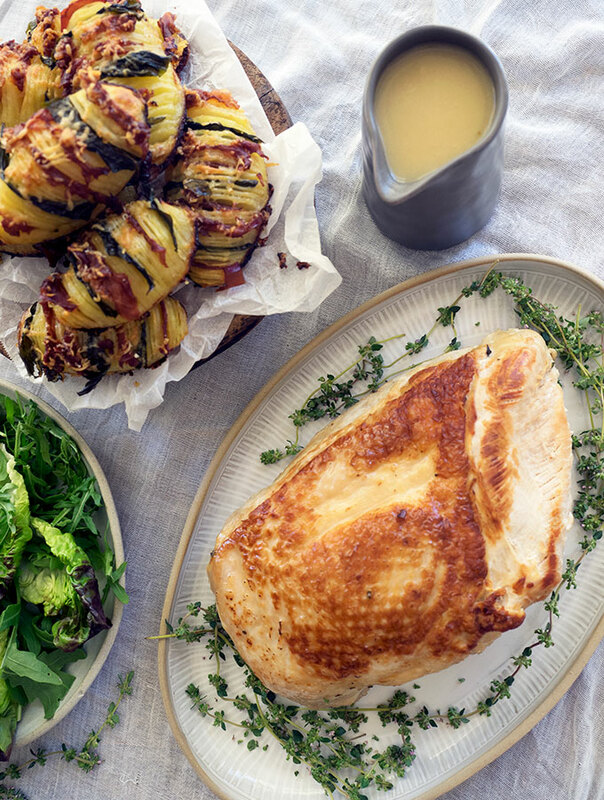 I served it simply with a crispy green salad and hasselback potatoes. The poached turkey breast will serve four people as a main meal with a couple of sides. You can make it stretch to serve six or eight people with another main dish along with the sides. There you have it, my easy poached turkey breast with even easier delicious gravy! Poached Turkey Breast & Easy Gravy is the perfect recipe for Christmas entertaining. Especially if you are short on time and oven space, the turkey will be on the table in 50 minutes. Poaching aids keeping the breast succulent and tender. Plus the gravy in this recipe is super easy to make and really delicious! This serves 6-8 people as part of a menu with additional dishes and 4 people as the main meal with sides. Place a heavy based saucepan (with a lid) on the stove, medium heat. Melt butter and oil in the pan. Season both sides of the turkey breast with salt and ground black pepper. Place turkey in pan skin side down. Cook turkey for 5 minutes or until skin is golden brown. I find it helps to move the turkey around with a spatula a little at the start to help prevent sticking. Turn turkey over and brown on the other side for 5 minutes or until golden. Remove turkey from pan and place on a plate. With pan on a low heat, pour sherry into pan and deglaze your pan. Make sure to scrape off all the brown bits of caramelisation from browning the turkey. Add turkey back to the pan with leek, thyme, garlic, bay leaves, peppercorns and lemon peel. Add stock to the pan. Important: add enough stock that the sides of the turkey are covered but not the skin. Over a low heat bring poaching liquid to a simmer and cook covered for 30 minutes or until cooked through. Strain poaching liquid through a fine sieve into a bowl or jug. Pressing down on the solids to extract as much flavour as possible. You will need 1L of liquid to make the gravy. In a non stick pan (you can use the pan you poached your turkey in if you wish) melt butter over medium heat until starting to foam. Whisk flour into butter mixture, keep whisking and cook for 2-3 minutes until golden. Keep whisking and gradually pour in the reserved poaching liquid. Continue to cook while gently whisking for a few more minutes until gravy is smooth and has thickened. Pour gravy into a serving jug. Serve gravy with poached turkey. Browning your turkey breast before poaching caramelises the meat which adds flavour to your final dish. Store any leftover turkey covered in the refrigerator. It will keep for up to 2 days if not eaten first! « Is this the Best Buffet Breakfast in Singapore? 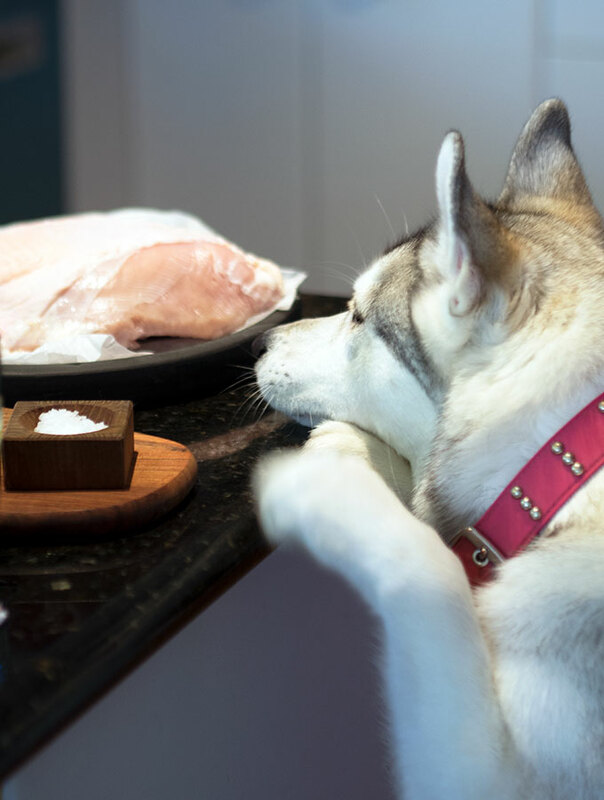 Great recipe and Harley is the cutest!!!!! I’ll be making this for Christmas, sounds easy and delicious, thanks!